Restaurant Compound Butters, Seasonings and More! Butter Recipes and seasonings can add so much to your cooking endeavors! AND…they are easy to make and store! This is one of my favorite types of cooking ...making up “compound” butter recipes and seasonings to enhance the flavor of other foods such as pasta, rice, meats, vegetables, breads, potatoes, soups, sauces ...you name it ...the possibilities are endless. Some chefs would have you believe these are "secret" and difficult. They are neither. YOU can make them easily! Compound butters are really only butter combined with other ingredients to create a new taste experience. 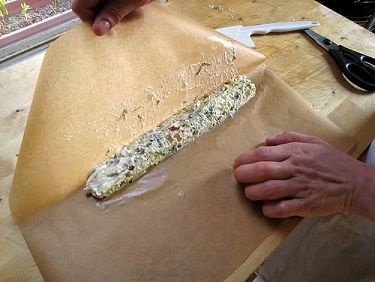 Compound butter is simply flavored butter that is rolled into a log, wrapped in wax paper or parchment paper and sliced when needed. Or you can pipe the mixture into rosettes or mini molds and freeze for later use. But compound butters can bring a wonderful burst of flavor to recipes and most people simply don’t use them enough, perhaps because most people don’t realize how easy it is to make a flavored butter. Most recipes for flavored butter are quick and easy and the left over butter can be refrigerated or frozen for use later. Making and using flavored butters is great fun. 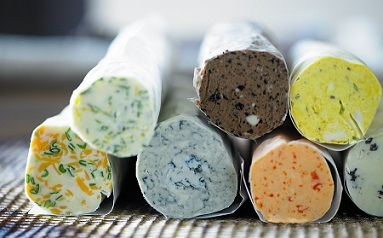 I think everyone who cooks should have a few flavored butters in the freezer. They are life-savers for quick garnishes and last minute enhancements. Having a broiled fillet of cod or salmon for dinner? That’s pretty easy and sometimes a bit boring. But top that fillet with the restaurant recipe for Lemon Herb Butter or melt some Raspberry-Roasted Garlic Butter over a breast of chicken and you and your guests will remember the meal for a long time. I also use certain restaurant recipes for butters as decorative and flavorful finishes for hot soups and on corn (sun-dried tomato and basil butter?) and on roasted vegetables. Creating successful restaurant butter recipes is fun ...that’s why I like doing it. Transform what might be an ordinary eating experience into a gourmet treat to be remembered. Use these successful restaurant recipes for butters, but don’t be afraid to come up with your own favorite combinations of spices, herbs, mustards, cheeses and other ingredients. You may have a real restaurant recipe! Blue Cheese Butter or Bleu Cheese Butter? It doesn't matter how you spell it, my restaurant recipe for this butter is a delicious enhancement for a steak. Preparation time: 10 minutes. Serves 8-10. 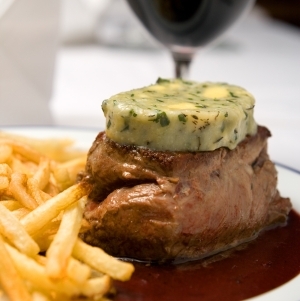 Steaks served with special flavored butter, such as my recipe for brandy steak butter, can really make the meal memorial. The brandy butter not only adds flavor, it adds elegance to the entire meal. Preparation time: 15 minutes. Serves 8-10. Use drawn butter for making dishes that benefit from buttery flavor but must be cooked over moderately high heat, such as sautéed potatoes, eggs, fish, and many other items. It is also used to make hollandaise sauce and several other similar sauces. This Dill Butter Recipe combines dill, garlic and lemon with butter to use as a special flavor enhancement for a variety of foods, limited only by your imagination. Preparation time: 15 minutes. Makes one large rolled log. Many people at the restaurant love the restaurant recipe to add to their beef entrees. It is a favorite restaurant recipe. It is also an extremely easy recipe and can be modified with herbs and spices to your liking. Gorgonzola is not a strong Bleu cheese as some others. Preparation time: 10 minutes. Servings: 15. The restaurant recipe for this Herb Butter Spread wasn't one I made up. I ran across it some time ago when I purchased a carton of Organic Valley Butter, a product I always use. Inside the carton I found this recipe and decided it looked good enough to put to the ultimate test. Preparation time: 10 minutes. 12- 15 servings. Elegant, deliciously easy flavored herb butters such as my restaurant recipe for Lemon Herb Butter add fabulous tastes to even the simplest of prepared meals. Preparation time: 15 minutes. Servings: 10-12. Not a butter, of course, but NOT to be :forgotten." This sugared walnut recipe is good to use for enhancing salads. They can also be used on an appetizer tray or eaten as a snack. Preparation time: 10-12 minutes. Makes 1 pound. Ribs! Rib Dry Rub Recipe! Cooking times are approximate. When the ends of the bones protrude and the meat is tender enough to pull apart with your fingers, your ribs are done. This Mexican seasoning mix adds authentic flavor to Mexican dishes. This recipe can be used for enchiladas, tacos, ground beef, burgers, chicken, eggs, potatoes and more! Preparation time: 10 minutes. Serves 6. Thanks for finding the website with real restaurant recipes. Stay awhile and click through the site to discover more restaurant recipes and cooking and food information. Enjoy your butter recipes! Did you know? "Compound butter" is a recipe that combines butter with a flavoring agent or agents – commonly fruit, herbs, spices or other aromatic ingredients. Garlic butter is a widely-known type.